Aim. 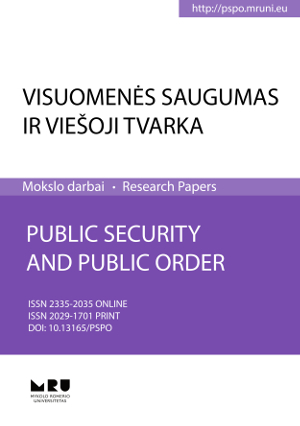 The journal Public Security and Public Order aims to analyze the problems of public security and related fields in dynamic, rapidly changing environment with the knowledge of Lithuanian and foreign scholars. Format of publication. The journal Public Security and Public Order is oriented for publishing articles, first of all, from the following fields of research: law, economics, management, sociology, human resources, psychology, philosophy, environment, public administration and other fields related to public security problems. Periodicity. The journal Public Security and Public Order was initiated in 2008, the periodicity is twice per year, in June and December.All articles to Public Security and Public Order are posted online immediately as they are ready for publication. All articles will be assigned a DOI number (Digital Object Identifier) whereby they become searchable and citable without delay. Indexation. The academic journal Public Security and Public Order is included in the EBSCO Publishing [International Security & Counter Terrorism Reference Center], Index Copernicus, international databases. Open Access Policy. This is an open access journal which means that all content is freely available without charge to the user or his/her institution. Users are allowed to read, download, copy, distribute, print, search, or link to the full texts of the articles in this journal without asking prior permission from the publisher or the author. This is in accordance with the BOAI definition of open access. Publication Fee. Publishing in Public Security and Public Order is free of charge. In other words, there are no article submission or article processing fees. 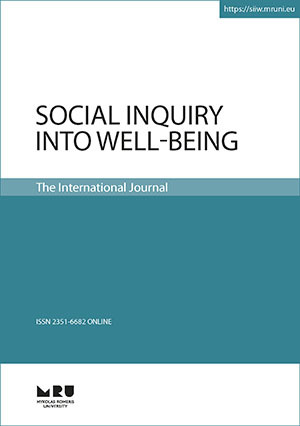 The international journal Social Inquiry into Well-Being (SIIW) is a peer reviewed interdisciplinary journal in social sciences publishing theoretical and empirical work that uses a variety of methodological approaches to study the whole spectrum of aspects of well-being of the individuals and of the social groups. Since well-being is a multi-dimensional concept, SIIW is designed to attract papers that discuss individual well-being in a variety of its dimensions (psychological well-being, social and occupational well-being, as well as spiritual and physical), as well as a large spectrum of social well-being of families, communities, and societies (including inputs of psychology, sociology, social policy, education, philosophy, etc.). We welcome papers crafted from interdisciplinary and international perspectives, based on concepts such as well-being, life satisfaction, positive development, happiness, wellness, welfare, quality of life, values, culture, community well-being and on other related issues that are meaningful for individuals and for many sectors of society. The journal accepts integrative articles and reviews, however, empirical articles constitute the core material published in the journal. Aim. The journal Intellectual Economics aims to solve intellectual resources and intellectual capital problems with the knowledge of Lithuanian and foreign scholars. Format of publication. The journal Intellectual Economics is oriented for publishing articles, first of all, from the following fields of research: Intellectual economics, Innovations and Investment Management, Knowledge Economics, Sustainable Development of Economy and Social Technologies, ICT economy, Human Resource Management, Effective Management of Economic Systems. Periodicity. The journal Intellectual Economics was initiated in 2007, April, June, November, December issues per year. Indexation. The academic journal Intellectual Economics is included in the Scopus. 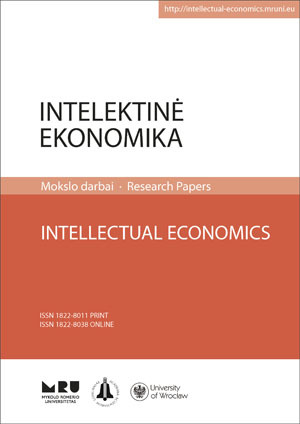 The academic journal Intellectual Economics is included in the EBSCO Publishing, Inc. (EconLit), C.E.E.O.L., PROQUEST and ULRICH'S international databases. Aim. 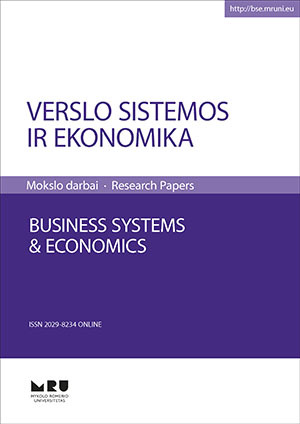 Business Systems and Economics (BSE) is a scientific journal whose purpose is to facilitate the publication of research articles in the related fields of business systems, economics, and issues arising from these areas. BSE examines a wide variety of business decisions, processes and activities, as well as within the systems approach framework. Format of publication. Topics of the journal include, but are not limited to Competitiveness of Nations in Global Economy, Corporate Governance, Institutional Economics, Modeling and Simulation of Business Systems, New Challenges of Financial Economics, Management Information Systems, Organizational Behaviour and Theory, Corporations Social Responsibility, Labour Relations and Human Resource Management, Project and Programme Evaluation and Management, Business Law, Managing of Changes of Services and Trade, Partnership Network Creation and Development, Marketing Theory and Practice, Promotion of Harmonious Consumption Skills, Creation of New Business Management, and Small, and Medium-Size Business Development Models. Periodicity. Journal is issued semi-annually. Articles are published in Lithuanian and English. Indexation. The academic journal Business Systems and Economics is included in the Inc., C.E.E.O.L., PROQUEST and ULRICH'S international databases. Aim. 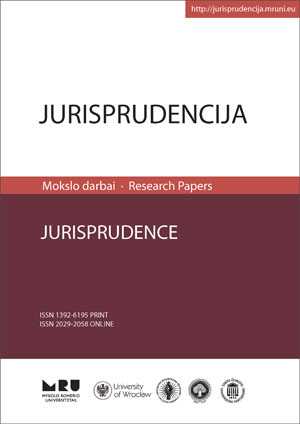 Jurisprudence aims to initiate scientific dialog between legal professionals and academics of Eastern and Central Europe in order to consider the main challenges their legal systems are facing in the transition period towards Western legal order. The emphasis is put on the reception of modern legal thought, Western legal tradition and the implementation of European Union law. Format of publication. 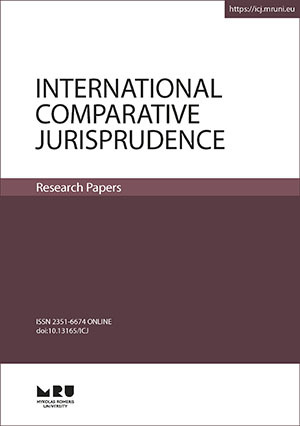 Jurisprudence publishes original scholarly articles in various fields of law: Legal philosophy and theory, Comparative law, Legal history, Constitutional law, Private international law and public international law, European Union law, Civil law (Intellectual property law, Family law, etc. ), Civil procedure law, Administrative law, Administrative procedure law, Environmental law, Criminal law, Criminal procedure law, Business law, Labour law, Finance law, Banking, corporate and tax law, Biolaw, Criminology, Criminal investigation, Legal informatics and etc. Periodicity. Articles are published in Lithuanian, English, 4 volumes are published per year. Indexation. The academic journal Jurisprudenceis included in the EBSCO Publishing, Inc., C.E.E.O.L., PROQUEST and ULRICH'S international databases. Aim. Research journal Societal Studies aims to promote a scientific dialogue between scholars worldwide; analyze social problems specific to the national situation and to global environment; promote innovative research areas; develop interdisciplinary research of Social Sciences and the Humanities. Format of publication. 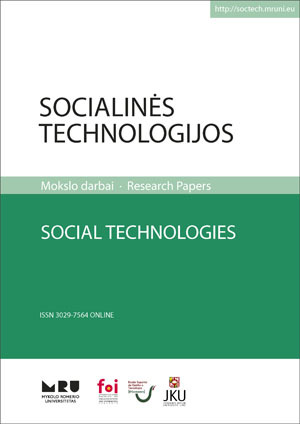 The research articles on theoretical and practical problems relating to various traditional areas of Social Sciences (Law, Economics, Management, Administration, Politology, Sociology, Psychology, Education Science, Social Informatics, etc.) and of the Humanities (Philology; History, Philosophy, Theology and Culture Studies; Art Studies, etc.) as well as to newly-structured broad fields of study (Area Studies: African, American, Asian, Australian and European Studies, Cultural and Media Studies, etc.) and to trans-disciplinary research areas (Migration Studies, Studies into Culture and Technology, etc.). Periodicity. 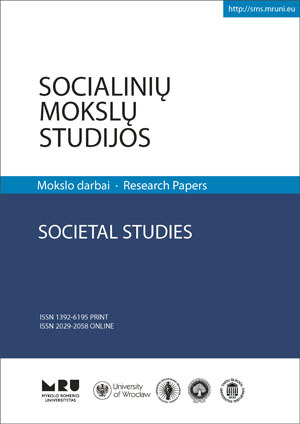 The research journal Societal Studies is published twice a year; original and previously unpublished scholarly articles, written in Lithuanian, English, German or French or, by a separate permission of the board of editors, an article may be published in a language different from the above. Indexation. The academic journal Societal Studies is included in the EBSCO Publishing, Inc., C.E.E.O.L., PROQUEST and ULRICH'S international databases. Aim. 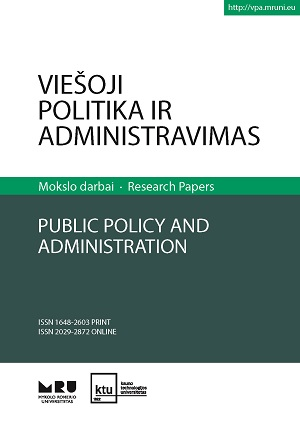 The academic journal Public Policy and Administration aims to encourage scientific research aimed at finding new theoretical and practical solutions for the formation and implementation of public policy; analyze current trends in public administration and suggest new alternatives for decision making and implementation for public administration practice; pay special attention to the analysis and critical evaluation of the processes of public administration in Eastern and Central Europe; contribute to the improvement of the research methodology in the field of public policy; ensure effective dissemination of scientific knowledge by publishing relevant up-to-date studies and conference reviews. Format of publication. 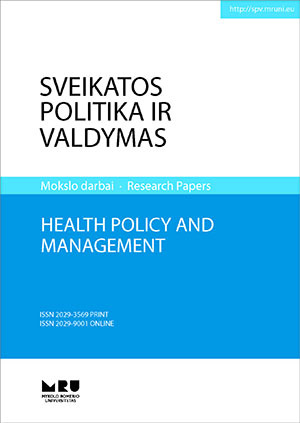 The journal includes articles analyzing theoretical and practical issues in the areas of public policy and administration in Central and Eastern Europe. Priority is given to articles analyzing transformational processes and reform management in Ukraine, Belarus, Russia, Latvia, Poland, the Czech Republic, good practices of these countries, current issues in the formation and implementation of public policy in Lithuania and, among them, the developments in the public administration reform and the implementation of European Union standards. Of particular interest are institutional and functional issues in EU governance, regional development of knowledge society, managerial competencies of public servants and ethical problems. The journal also reviews conferences, books, and events of interest to the fields of public policy and administration. Periodicity. Articles are published in Lithuanian, English, German and Russian quarterly. Indexation. The academic journal Public Policy and Administration is included in the Scopus, EBSCO Publishing, Inc., C.E.E.O.L., PROQUEST and ULRICH'S international databases. Aim. The periodical peer-reviewed journal Social Work aims to promote dialogue between researchers from different branches of social science (social policy, social work, sociology, education, psychology, etc.) and to present interdisciplinary studies on social development and population problems in Lithuania, the EU, Eastern and Central European. Format of publication. 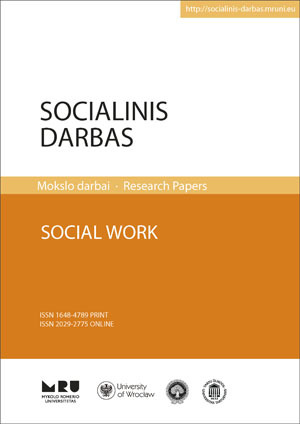 Social Work publishes original scientific articles, reviews of scholarly monographs and other publications, abstracts and other informative publications in the Lithuanian or English languages. Upon the decision of the Editorial Board, publications in other languages may be included. The academic journal Social Work publishes articles dealing with the issues from the fields of social policy, social work, sociology, psychology and education science. Periodicity. The academic journal Social Work is published twice a year (in May and November). Indexation. The academic journal Social Work is included in the Ulrich’s PROQUEST, DOAJ, C.E.E.O.L. databases. Aim. The scientific journal Sustainable Development Strategy and Practice aims to analyze sustainable development problems at national, international and regional levels; promote environmental research in the context of sustainable development; to encourage multidisciplinary research in environmental science and promote innovations; to promote dialogue on sustainable development between researchers from different fields of work. Format of publication. Main topics of the journal are sustainable development practice and theory; environmental management; environmental protection practice; regional and territorial development; social and economical aspects of environmental conservation. Periodicity. Journal is published once a year. Indexation. 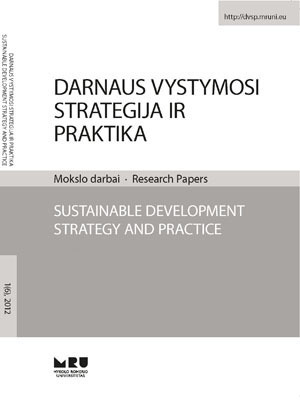 The academic journal Sustainable Development Strategy and Practiceis included in the EBSCO Publishing, Inc., C.E.E.O.L., PROQUEST and ULRICH'S international databases.